BALTIMORE—The National Association of Regulatory Utility Commissioners installed Connecticut Public Utilities Regulatory Authority Vice Chair John W. ‘Jack’ Betkoski III as its new President at its Annual Meeting and Education Conference in Baltimore, Maryland. More than 1,300 attendees were on hand for the meeting, held November 12-15, which convened national utility regulators, industry representatives and consumer advocates for panels that covered a range of issues across the energy, telecommunications and water sectors. The theme for the meeting was Infrastructure, Innovation and Investment, which was established at last year’s meeting by then-President Robert F. Powelson of Pennsylvania. Welcome remarks were delivered by Baltimore Mayor Catherine E. Pugh at the opening general session, held at the Hilton Hotel in downtown Baltimore. As president, Betkoski will assume general oversight of the Association; serve as NARUC’s primary voice; and represent NARUC before Congress, the courts and administrative agencies. He is also responsible for designating members to the NARUC Board of Directors, committee leadership positions and other Association appointments as necessary. During his installation remarks, Betkoski unveiled his theme for the year: Powered Together: Tapping the Water Energy Nexus. In his comments, he outlined the reasons for his focus and how his priorities will take shape. “Water, as we know, is indispensable for energy production, including both electricity and sources of fuel such as oil and natural gas,” he said. He cited the poor grades from the American Society of Civil Engineers—scores of D for water and wastewater, caused by a failing infrastructure. Betkoski noted potential cybersecurity vulnerabilities, water issues caused by natural disasters and the importance of reliable telecommunications to support water and energy. “[W]e can’t be concerned about the infrastructure and reliability of water and energy and exclude telecommunications from the conversation. If one of the three fails, then all are vulnerable,” he said. Betkoski would like to see more engagement surrounding the issue and urged state commissions to share concerns and solutions related to the water-energy nexus. Moreover, he proposed that NARUC create an online microsite related to the topic, to include a resource library and lists of experts. He also announced a goal for NARUC to create a water-energy app, to be unveiled at the 2018 annual meeting in Orlando, Florida. Other leaders installed include Wisconsin Chair Ellen Nowak as First Vice President and North Carolina Chairman Edward S. Finley, Jr., as Second Vice President. 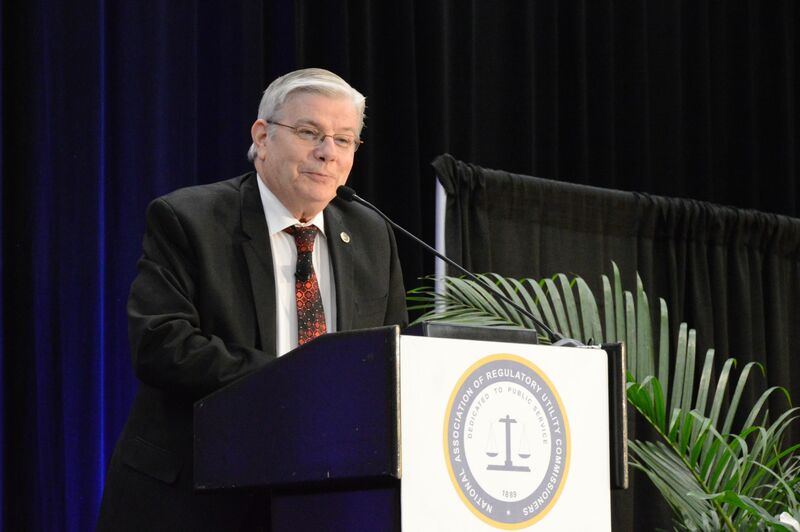 All resolutions, including honorary resolutions, are online at bit.ly/NARUCAnnual17Resolutions. The NRRI Board elected North Carolina Commissioner ToNola D. Brown-Bland as the chair and Rhode Island Commissioner Marion S. Gold as vice chair. Each leadership position is for a two-year term. District of Columbia Chairman Betty Ann Kane was elected as treasurer and NARUC and NRRI Executive Director Greg White will serve as secretary. Past President Robert Powelson and the Executive Committee established a Natural Gas Access and Expansion Task Force, which was charged with producing a report. The Task Force was charged with developing best practices and recommendations regarding natural gas service for underserved and unserved areas of the country, including, but not limited to rural communities. A copy of the report is available at http://bit.ly/GasTaskForce. Awards for regulatory innovation were presented during the installation luncheon. The innovation awards program, envisioned by past NARUC President Robert Powelson, were managed by the Association’s Task Force on Innovation. The committee’s chair, Illinois Chairman Brien Sheahan, presided over the presentation, with assistance from FERC Commissioner Powelson. The New York State Department of Public Service for creating a new methodology to value and compensate distributed energy resources. The Sacramento Municipal Utility District for testing a new cooling technology that significantly reduces summer peak loads. Danny Kermode of the Washington Utilities and Transportation Commission for exceptional work in adapting an international business reporting standard to data from public utilities. Puget Sound Energy for its energy upgrades campaign. Demand Energy and its Partners Village for their cutting-edge microgrid. First Solar, California ISO and NREL for technical breakthroughs in solar plants. SUEZ Smart Water Network for state-of-the-art technology deployment and management in all parts of its water value chain. AEP for its breakthrough overhead line design (BOLD) transmission system. National Grid for bringing demand response to gas. OneWeb for proposed constellation of satellites that will provide broadband Internet access to hard-to-reach areas across the globe. Also, the Terry Barnich Award for excellence in NARUC’s International Programs was awarded to Andreas D. Thanos of the Massachusetts Department of Public Utilities. The press release is available at http://bit.ly/2ii7C0O. NARUC is the national association representing the state utility regulators who regulate essential utility services such as electricity, telecommunications, gas, water and transportation. The Association holds three national meetings annually.